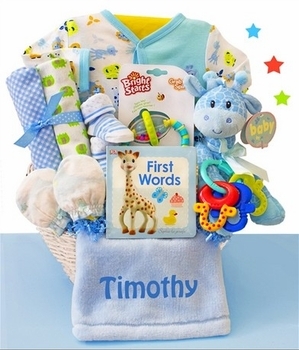 Welcome the new baby boy with one of these wonderful gift designs personalized with his name! Our personalized gifts feature blankets, hats, clothing and more with the baby�s name prominently displayed in the design. The new parents will just love these and they are so beautiful, they will want to hang onto them as a baby keepsake. You will find many variations of themes and designs including gift baskets, nursery furniture, wall d�cor and more. Everything is guaranteed to be of the highest quality including the personalization. Using state of the art techniques, our designers can create something for you that will become a beautiful way to herald the arrival of that special new baby boy. Every gift shown also includes free shipping! Please call us toll-free at 866-476-0213, if you have any questions at all.